Steve Roberts, who has been peddling his 225 lb custom-built recumbent bicycle around America, (which, by the way, relies on a Portable PLUS computer for navigation, communications, and journalistic duties) will be here (with bicycle) for a lunchtime presentation, discussion, and chance to meet the people responsible for the Portable PLUS. 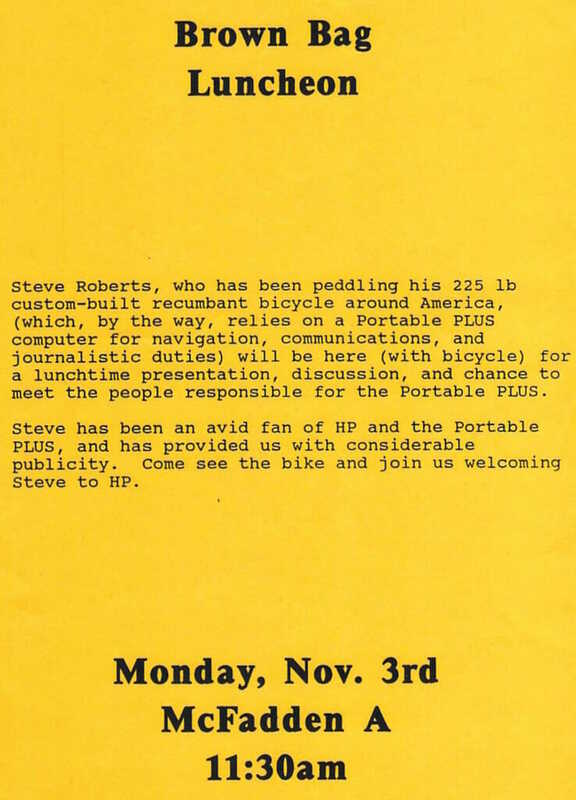 Steve has been an avid fan of HP and the Portable PLUS, and has provided us with considerable publicity. Come see the bike and join us welcoming Steve to HP. There was also local media coverage of the event.